↑ "Chronology". 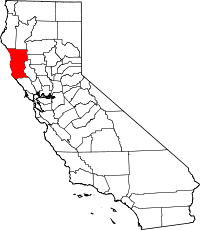 California State Association of Counties. Retrieved February 6, 2015. ↑ "Anthony Peak". Peakbagger.com. Retrieved March 26, 2015. ↑ "American Fact Finder - Results". United States Census Bureau. Retrieved April 4, 2016. This page was last changed on 25 May 2018, at 17:08.